The H Gallery + Studios is a 10,000 square foot vintage building completely dedicated to the arts. The H Gallery includes a large Main Gallery on the first floor, a secondary feature exhibit room called SPACE140 upstairs, a 2700 cubic foot suspended installation area and 15 artist studios. All exhibitions at The H Gallery are curated exclusively by Dab Art. For more information about The H Gallery, visit www.TheHUD.Gallery. 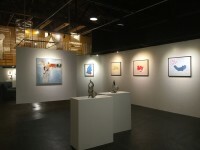 To view upcoming or past exhibitions visit www.DabArt.me.